Learn what copyright is, why it is important, and how to use information legally. Attribution: Giving credit to an author by citing or noting who is responsible for the information. This is important, but it doesn't substitute for having permission to use copyrighted material. Copyright Infringement: Copying, displaying, or distributing copyrighted material without permission from the owner. Infringement can be punishable by law. Copyright Owner: The person or entity with sole right to reproduce, distribute, perform, or display copyrighted material. Usually the creator of the material. Copyright Notice: This familiar symbol (©) indicates copyright but it need not be present to protect a work. Creative Commons: An alternative to copyright that allows the creator of a copyrightable work to offer a license that specifies the conditions for its use. Fair Use: The right, under certain conditions, to duplicate, distribute, or perform portions of copyrighted material without first obtaining permission. First Sale Doctrine: Gives the owner of a copy of a work the right to lend, resell, or dispose of that copy. This is what allows libraries to lend books and bookstores to sell used books. Plagiarism: Presenting someone elses work as your own, which may not always be an infringement of copyright, but this unethical behavior can result in disciplinary action at school or work. Public Domain: Materials that are not protected by copyright. Works may be in the public domain because they are not eligible to be copyrighted, the copyright term has expired, or the owner has given up copyright. 1. Click to view a short video and learn more about copyright. 2. Copyright Basics is a 12-page guide, covering what types of works are protected, how to secure copyright, how long copyright lasts, and how to register for copyright. 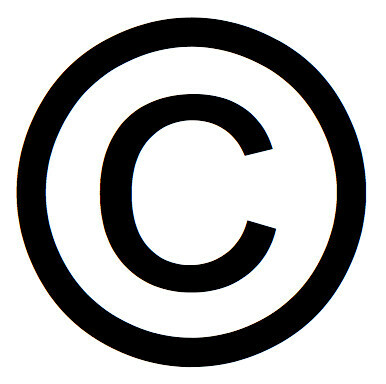 The copyright symbol indicates copyright, but it is not required for protected works.